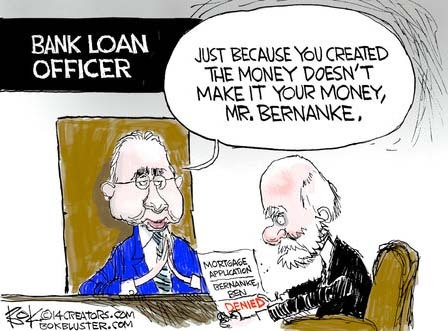 October 9, 2014 bailout, banking, Economy, Fannie Mae, Government, Uncategorized, Wall St.
What good is quantitative easing if Ben Bernanke can’t get a loan? The former Fed chairman confided last week that he was unable to refinance his $850,000 home mortgage. It’s true he’s out of a job but ex-government swells are never out of the money. Bernanke is still making the stuff from thin air (or hot air) by cranking out speeches at more than $200,000 a pop. IBD notes that even Barney Frank now lays some blame on the government for the 2008 banking crisis. It forced banks to lend to risky home buyers and now Dodd Frank is overcorrecting by putting the clamps on the banking industry. Banks have been forced to close branches to pay penalties. They’re sitting on piles of free money but they’re reluctant to lend, even to Helicopter Ben.